The disappearance of a Boeing 777 airliner with 239 people on board has ignited speculation ranging from catastrophic malfunction to hijacking. That the United States, a global power with the intelligence assets to solve this mystery, has decided to keep a low profile in addressing this mystery is not surprising. For one thing, “leading from behind” has become a theme in the Obama administration’s approach to global affairs, especially in the Islamic world. This is evidenced in the lack of reaction to the attack on the U.S. consulate in Benghazi on September 11, 2012, the ongoing tragedy in Syria where Moscow has taken the lead and is bolstering the murderous Assad regime, and to the blind eye turned to persecution of Christians from North Korea to the Middle East. In this case, however, there may be good reasons for keeping a low profile and doing so does not necessarily reflect U.S. impotence or lack of initiative. Things might be different if this had been a U.S. air carrier filled with Americans. News outlets would be interviewing distraught families of missing passengers throughout the 24/7 news cycle. Their questions would be more pointed and the pressure to respond would prompt a far greater level of American involvement. A highly visible U.S. response also would benefit the administration by diverting attention from the IRS scandal, the uproar over Obamacare, and also any information gained from electronic and other means of intelligence gathering could silence criticism concerning intrusion into privacy. Given U.S. intelligence capabilities it is possible the Obama administration, constrained both by diplomatic considerations and the need to protect national security, knows more than it is revealing. Diplomatically, since the vast majority of those on board the plane are Malaysians and Chinese and the missing aircraft is Malaysian, Washington probably wants to be sensitive to Malaysia and China–the nations primarily leading the search. Furthermore, there are significant national security concerns. Since there is no pressure from the U.S. media interviewing distraught relatives, and U.S. talk show hosts are not lambasting the administration to act, Washington doesn’t have to reveal how much we may know and risk jeopardizing the capabilities of advanced reconnaissance assets. This doesn’t mean the primary actors cannot be nudged in the right direction. The seemingly ambiguous attitude of the Malaysian officials may result from their desire to distance themselves from the U.S., since Malaysia is a Muslim nation and Islamist perfidy may be involved. They also might recall how Washington deserted South Vietnam, Cambodia, and Laos in 1975 and is currently bailing on Iraq and Afghanistan and might not want to get burned by seeming to cooperate too closely with the United States. It is likely U.S. intelligence quickly figured the missing plane was hijacked. When the search off the coast of Thailand and Vietnam proved futile, a story appeared that Malay military radar detected a change in MA 370’s direction. Then, when Chinese intelligence offered a photo of something floating off the Vietnamese coast, suddenly a new story revealed that engine monitors continued functioning for hours after MA370 turned sharply west. By now the National Reconnaissance Office should have tasked its assets to survey areas within a 7,000-mile radius from where the plane diverted course. Super computers should be able to compile a list of airfields in secluded areas that have been recently refurbished to include a building large enough to conceal a Boeing 777. Also, a long runway would be needed—one 10,000 feet long if this plane is going to take off. 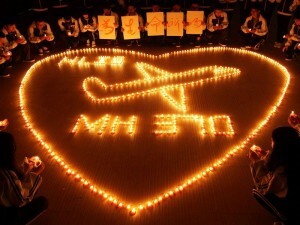 If MA 370 isn’t at the bottom of the Indian Ocean, then who took it? Leading suspects capable of such an operation include al-Qaeda, Iran’s Quds Force, and the Pakistani Inter-Services Intelligence. Each would have different motivations and plans for what to do with the plane. Reaching mainland America would be a stretch, but cities in Western Europe, or targets in Guam or Hawaii could be possible. Al-Qaeda might convert the plane into a flying bomb to hit any number of targets: the U.S. base in Diego Garcia; Bagram Air Base in Afghanistan; or, a target in the Persian Gulf. A strike on Pearl Harbor would grab the kind of press coverage al-Qaeda craves and Israel would be high on Iran’s list. If this was a hijacking, time is critical. The terrorists know they must strike before U.S. Special Forces respond or before potential targets from Honolulu to Tel Aviv are alerted making it more difficult for a large airliner chocked full of explosives to reach its target. Ten days into this mystery it is clearer than ever: It is time to let U.S. intelligence do its thing. The newsworthy event has become a mystery, a sensation a topic for endless “reporting”, analysis and interviews of people who know nothing by people who know even less. Perfect topic for American TV, non-information being sold, yes sold, to advertisers and the dumb public. How else can the networks fill the 24/7 cycle? I tuned in to The World Over on ESPN and actually got information that the Syrian nuns were released after the “evil” Assad paid a handsome ransom. I wouldn’t have known that watching my usual FNC. Here’s more conjecture, as valid as any I’ve heard – Putin took the plane to divert attention from the eastern Ukraine land grab. He liked the looks of Crimea from his vantage point in Sochi. He used that diversion to move his troops to the Black Sea, a popular hot spot for current and former Soviet communists. Our Intelligence missed that because the were reading the text messages of Americans at the Olympics. Our reporters were also busy making sure that the gays of the world had a gay time in Russia. Also noteworthy is the fact that, the whole time, our lefty was/is playing golf while his cohorts are getting massages, tans and doing so much about the weather.